Hello everyone. I’m Bojan Jovanovic and today I’ll share some tips that helped me with getting more business out of my website. 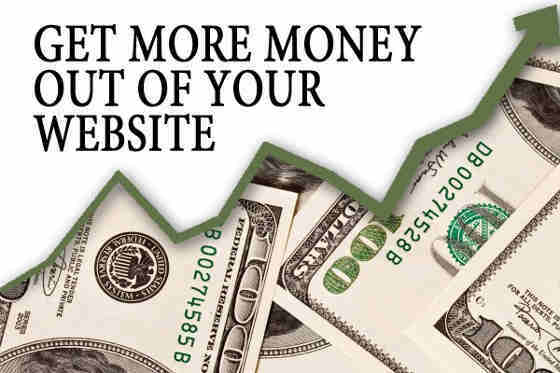 Many people think about how to drive more traffic to a website and that’s okay, you need traffic if you want to monetize your website. However, the vast majority of website owners think only about getting more visitors and not spending even a minute on turning these visitors into customers. In the following text, I’ll detail some of the easiest and the most effective tricks for getting more business out of your website. Have you ever thought why so many websites have share buttons floating on the left side of the screen? Have you noticed that most of the social networks put your image in the top left corner? One study revealed that content in the top left corner has the greatest likehood of being noticed (and clicked) by visitors. Now we better understand why so many social networks put our faces in the top left portion of a page. How can I use this fact? Maybe you don’t have a social network, but you can use this fact to make every website better. You just need to make a banner with a good call-to-action and put it in the top left corner of a page. If you wish, you can also make this banner in a way that it always floats in the top left corner, so user will see it even if the page is scrolled down. If you website is WordPress powered, you can use this free plugin for making floating banner, or you can use my free Jquery floating bar script if your website has custom made CMS or you don’t use CMS at all. If you use your website to promote your services, you probably have an option for contact via phone. However, many website owners put their phone number only on the “contact page” which can result in the loss of potential customers! According to my recent study, 16.8 percents of website visitors are coming only to get your phone number, and 90 percent of them visited only one page of my website! If you have your phone number only on your “contact page”, these 90 percent of people looking for your phone number won’t find it because they won’t even visit your contact page! Instead, they’ll just click the “back button” in their browser and go to the next website. You’re never the only one that provides certain services! Let’s take a look at one example. If your website has 1000 visits per month, 168 of them will look only for your phone number. Even if you convert 1 percent of them into your customers, you’ll still get 1-2 jobs monthly. However, if you have you phone number only on “contact page”, only 16-17 would find it. If you again convert 1 percent of them into your customers, you’ll get 2 jobs every 6 months 🙁 I think now it’s clear how important is to have phone number on every page! Another important benefit to providing a phone contact option is that many big brands don’t offer phone contact. If you compete against some of the big brands, you can use phone contact to “steal” some business from them. There are still some people that prefer phone contact. You can combine this and the previous tip. You can make a floating banner with text such as “call us: YOUR-PHONE-NUMBER” to create a stronger phone number presence on every page even more effective. If you have a phone number on your website you should think about having separate number for business and for friends and family. You need to be able to turn off your phone when not working and still be available for your loved ones. Please keep in mind that as your website grows you’ll start to get more and more unwanted calls. Many website owners are hesitant to link to other relevant websites because they think that visitor won’t return if they click on a link that points to other website. While I can’t disagree with them, I think that smart usage of links can help you a lot. The first thing I want to suggest you to use target=”_blank” attribute on every link that points to external pages. If you do that, when visitors click on that link, the page will be opened in a new window/tab and your website will remain active in other tab. When visitors finish reading the opened page they will return to your site. If you use WordPress or any other CMS, just select “Open link in a new window/tab” option when adding links. Links to relevant websites improve the rankings of your website. Many Webmasters noticed that Google rewards websites that link to relevant and useful resources. Getting better rankings on Google directly results in more traffic and more traffic can lead to more business. A study conducted by the University of Pennsylvania showed that uncredited articles have 56% less chance of being shared by readers. Linking out to resources used in posts will make it trustworthy and thus, more attractive for incoming links and sharing on social media. In it’s nature, human beings are hesitant. Many visitors tof your website will be interested in your services, but ultimately not even half of them will make a inquiry. You can’t change people, but you don’t need to wake their doubts with “reset” buttons. Why would you want to allow visitors to write a message just to press “reset” button thereafter. You want to encourage visitors to contact you. It might be a good idea to write that contacting you won’t obligate visitors to use your services. People are scared of being obligated to something without their knowledge. I know there are many more things that can improve your website. These four worked the best for me and are pretty easy to implement, too. If you have more tips, fell free to share them with us in the comments. I hope this post was useful for you. If you wish to get in touch with me visit my website or connect with me on Twitter and Google+. P.S. Don’t forget to check out my new free SEO tool. I have learned many important things from your post its really very informative and very useful things you have shared. The floating banners are a great suggestion! We’ve seen huge improvements in that. We’ve also actually started seeing conversions coming from our Google+ pages. We have been distributing content daily, engaging in communities, and sharing in local chatter. We’ve started seeing Google+ compete for pretty nice conversions. Our Hawthorn Lake Buena Vista location (http://www.hawthornlakebuenavista.com/) and our staySky Suites I-Drive Orlando (http://www.stayskysuitesidriveorlando.com/) are the two highest convertors. That is great news. Are you using Google Plus communities or your own business page or both? Right now, I’m testing it only for the business pages. Still working on pushing the personal profiles in there as well. According to my personal point of view, you should always get target traffic, when you are dealing with affiliation advertising networks. This practice may raise your sales and profit as well. I like your point about the rest button. Funny, but relevant. It’s almost dead, though. I hardly remember seeing it around! If you want to turn your website visitors into customers then you should make your website responsive and user-friendly which is the very first step. Then your website must contain graphical information which most of people like. If you follow these steps you may sure to achieve targeted customers. Turning your customers into leads is somewhat like everyone dream of. One must not greedily put up excess banners on his blog to earn more. Great work! A very informative and useful one. Thank you for sharing this experience. Very helpful and insightful article. I never thought that the social network button placement can have such an effect for the chances to be clicked by a visitor. Really a great post. Reset button is the one that caught my eye. I really agree with the fact “why should we let the cust reset the field once they have entered the information”. These tips provide so much value to people who are in the beginning with their blogs and websites. Thank you! I will apply them ASAP. One of the most common thing that I want to share is sharing it with a social site. FB and twitter is very useful for it. Preeti would love you to read ..How to use twitter for business marketing? Yeah.. Its a good and quality article for me. becaouse i was never read like this article Website Visitors into Customers really great. Thanks keep share usefull information with us. Bojan! “Put your phone number on every page of your site.” “Pop-up banner that reads, Call us 555-1212”. OMG… uh, DUH. I con’t believe I’ve been blowing this one very obvious tip in my local business’ web presence. Besides blogging about marketing small biz… I actually own a martial arts studio in Colorado. I know for a fact that my phone number is not on every page and that’s a sin I should never again commit. Also, great point about getting a popup. Rather than trying to glean email contact info, MY call to action should be for mom to call about classes for Junior… RIGHT NOW. Do you have a plugin or service that you use for phone numbers or custom messages versus email forms? It might be a good idea to place phone number somewhere in the footer too. Maybe someone will close pop-up without even looking at it. The main aim of online business is to convert a visitor into customer. Leaving contact number on a prominent place on a site can give you potential customers. Great article!Thanks for sharing. Think I need to come up with my own product as currently I am using affiliate programs which I am making peanuts out of! Keep it up! From Charles in Dubai. Adding a testimony page and clients reviews is the best way to get Customers onto our website ! While one has to be really interactive to do this ! I completely agree with you. Testimonials and reviews are powerful tools for building trust between you and your customers. Thanks for reading this post and sharing your tip! Bojan would love you to read ..Bing and Yahoo index content in noscript tag? Personally I don’t like the floating social bar, so I removed it from my site.I have quizzed friends and family, and they are the same. As for your links, always choose to open a link in a new tab. People will close a tab and then your site re appears, rather than people clicking the arrow to go back to your site. I guess different audiences like different things. It might be the best to test all these things and keep ones that work well. Thanks for sharing your experience with floating bars!